I don’t know why I love the Irish. Maybe it’s because I halfway belong to them on my mother’s side. 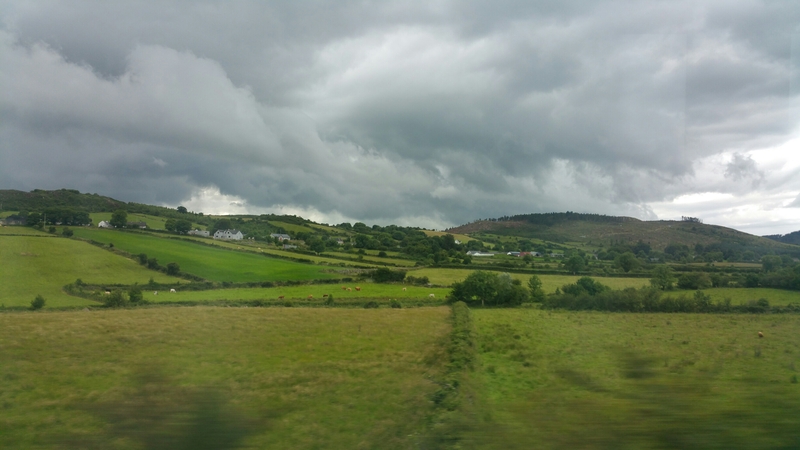 I snapped this pic from the train to Belfast from Dublin this summer. The Irish countryside is so delicious. But I also belong, halfway, to my father’s Scandinavian side. And the two sides of me are occasionally in conflict. But there is one thing they agree upon. Traveling expands you. My people are a traveling people. My ancestors set sail and did not look back. In the U.S. most of us are halfway something. And even if we came from this soil, this fertile soil of America, we too, are nomads. Travelers. So, too, are our relations – the gazelles leaping across the Serengeti or the Monarch butterflies flitting towards Mexico. All of us belong to a branch of the biological family that is on the move. The difference between us and our biological family is that when we return from our distant adventures – down the branch of the tree or across the vast plain or swamp or ocean – when we return from our journeys — we tell the tale. We huddle around the campfire, the Sunday dinner, the AA meeting, the bar, the water cooler, the back of the bus. And we regale our friends and family with stories of our successes and failures. We make something out of an ineffable nothing — that place that only resides in our memories — our distant homeland, our Ireland, our watering hole, our home. And that is why I love to travel. And I believe it comes from both the Irish and the Scandinavian. It is not that I love the journey — the uncertainty of where I’m going. But it is that I love to return and tell the tale. Where have you been? Where are you going? When you return, will you tell me all about it? And then that place — your place, your story — will live in my memory, as a story, too.